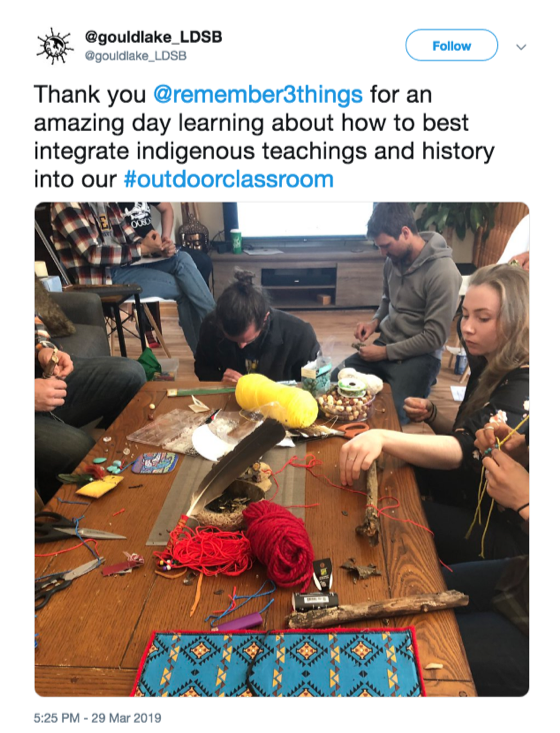 Our team at Three Things Consulting recently hosted the teaching, guiding and administration staff from the Gould Lake Outdoor Education Program which provides environmental and experiential education programs for elementary and secondary students in the Limestone District School Board, at our office for an Indigenous Awareness Community Talking Circle. These gatherings allow for trusting, respectful and reciprocal relationships to be built and enhanced through a daylong Circle that builds awareness and knowledge sharing, increased confidence in participants talking further about strengths, history and challenges of Indigenous people in Canada in their work and lives as well as much improved communications between all participants, Indigenous and not. 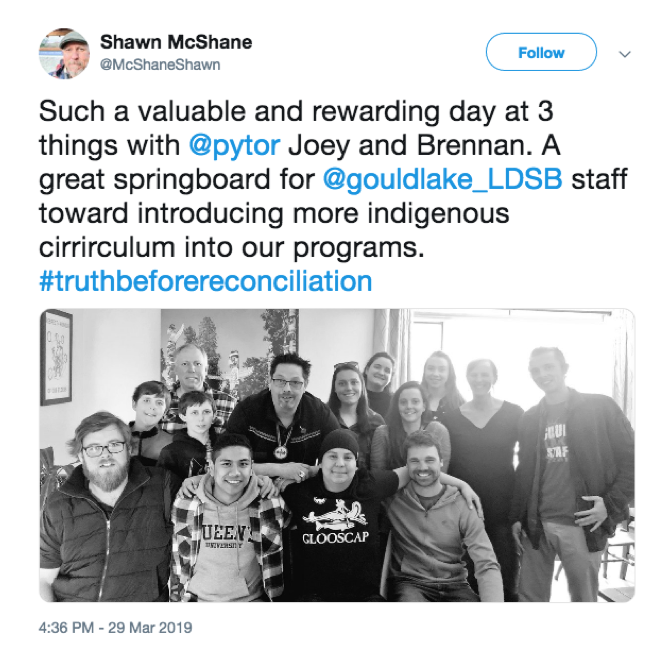 As we have a relationship with the team at Gould Lake and value the work they do with students, getting them connected to the land and creating meaningful space for conversations about Indigenous connections to the land, we offered this day pro bono. You can learn more about how Three Things gives back here. It was a great opportunity to have myself, Brennan Googoo, as I finish up a four month Internship with Three Things, and our Placement Student from Queens Faculty of Education The Aboriginal Teacher Education Program (ATEP), Joey Ozamiz, design a Circle specific to this audience. The team from Gould Lake, consisting of an entirely non-native group, were both surprisingly curious and immensely respectful, as well as diverse in age of participants. Several children of a team member joined us which brought a wonderful energy to the space, as did a high school co-op student; who also brought a powerful balance to the Circle. The day began bright & early, with myself and Joey Smudging and having Ceremony before making tobacco ties as an offering to the day’s participants. Starting your day (or event) in a good way, however that may look for you as an individual, is the foundation which Three Things Consulting has been built on. As Joey and Pytor spent the early morning making bannock for “Indian Tacos” to be served later that day for lunch, I continued to make medicine ties with hand-picked Tobacco which was then prayed and smudged over. The day was started with a discussion on why reconciliation matters, and why it’s so important to think of the “Truth” before we try to actually tackle reconciliation. This opening was followed by a lengthy discussion rooted in update to date facts and statistics on the Indigenous Peoples population in Canada. This led into a conversation and some learnings designed and facilitated by The Three Things team to scratch the surface of the history of Indian Residential Schools. This conversation was a deep, safe, and educational one met with overwhelming respect. The Gould Lake team asked many questions and was eager to continue to further educate themselves on the history of Residential Schools, as well as how to have meaningful and safe conversations on the topic. After a lunch break, (where our guests were invited to bring something to share as part of the Feast), the afternoon was opened by a session on the teachings and importance of the Sacred Circle or Medicine Wheel. This session involved an interactive talking circle activity which the Gould Lake team could easily use and facilitate in their respective trips and programing. The day ended with a talking stick activity, where Joey offered the teachings of the talking stick and the importance of “listening to listen, without listening to respond”. This quote from one of the Gould Lake team members that was shared with us following the talking circle is why we begin (and end) our events in a good way, grounded in Ceremony. Our Talking Circles are held to create a safe space where everyone can learn, and curiosity is encouraged. The Three Things team is well equipped for building this space, and we’re more than happy to facilitate not only the curation of these spaces – but the learnings that others can take back to create and hold these sorts of spaces, regardless of being indigenous or an ally to Indigenous Peoples. If you want our team to design a Circle for your community, group of organization, learn more here. This is such important work Pytor. Can’t wait to work more with you and your team.